Duct areas in square feet can be calculated by using geometry rules for round areas. The area will cover a two-dimensional slice of the duct. To then convert that to volume, you multiply the resulting area by the length. 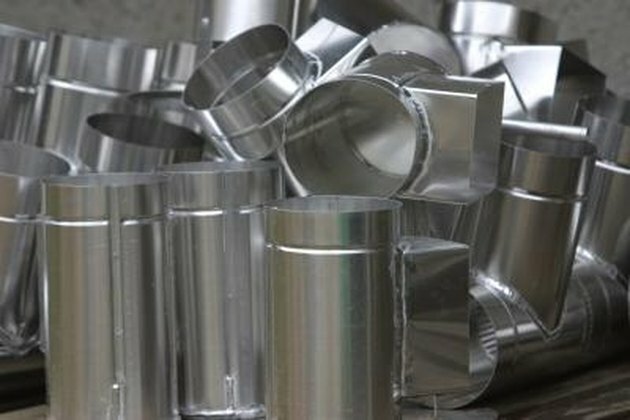 These calculations can be useful if you are figuring out flow numbers, trying to gauge material amounts or performing any other calculations necessary for the design and installation of ducts. Measure the diameter of the round duct across its widest point. Divide the diameter by 2 to get the radius of the duct. Multiply the radius by itself to get the square of the radius. For instance, if the radius is 10 inches, the square of the radius is 100. Multiply the square of the radius by 3.14 to get the area of the duct in square inches. In this example, the area is 314 square inches. Divide the area from Step 4 by 144 to get the area in square feet. Here, an area of 314 square inches is 2.39 square feet. Measure the length of the duct in feet (if you want to translate the two-dimensional area to the three-dimensional volume), then multiply the area by the length. Continuing this example, for a 10 foot duct the area is 23.9 feet.